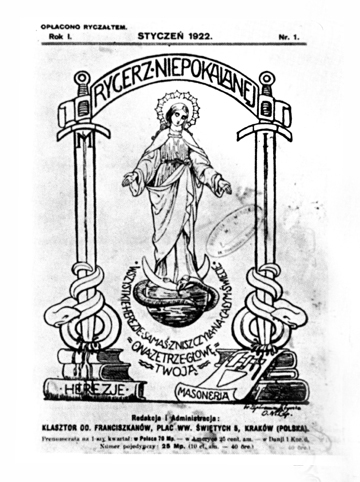 They were well aware of the influence the saint had on the Polish populace and had endeavored to win him over to their cause. The Nazis had even offered to register him as a Volksdeutsche, because of his German sounding surname, so eager were they to have him as a collaborator and propagandist. St. Maximilian had boldly refused the offer, but kept on filling out applications for permission to publish his magazine, though in retaliation, the Nazis continued to reject them. Finally, the saint’s perseverance paid off and by December 8, 1940 this only edition of the magazine published during the occupation reached the reading public. St. Maximilian contributed an article called: “Truth.” (As far as I know, the article has never been published in English in its entirety, so I present here a translation from the Italian–a translation of a translation, but it’s the best I can do.) You might say that it was St. Maximilian’s persistence to publish coupled with what he wrote that sealed his fate and ultimately led to his final arrest on February, 17, 1941. St. Maximilian was canonized a martyr of charity because he gave his life for a man he did not even know. He offered his life because he had the charity blessed by the Lord Himself as that no greater than which can be conceived (Jn 15:13). It seems to me that this final act of charity was a seamless development of his true commitment to the common good, which led him, like Christ to say what needed to be said, even if it was dangerous to do so. Like Christ, St. Maximilian died for love and like Christ he was killed because he told people the truth, no matter what. In his article, he makes several proposals which he explains and illustrates: the truth is one; the truth is powerful; religious truth is also one; truth must be acknowledge, failure to acknowledge it does not change it; only truth can make us happy. In simple terms the saint explained Catholic metaphysics and epistemology, grounding human thought on the principle of non-contradiction, namely, on the fact that a thing cannot both exist and not exist at one and the same time, and therefore that one and the same thing cannot be both true and not true at one and the same time and under the same respect. Common sense tells most of us that this principle is self-evidently true, but unfortunately, there are many today who had common sense brainwashed out of them. For instance, Freemasonic mumbo jumbo, with its assertion of religious convictions and simultaneous pretense of being a non-confessional system, is a fundamental violation of the principle. I have even had a Freemason on this blog scoff at the principle of non-contradiction. Those who are willing to engage in dishonest propaganda have always been among us. The pharisees used it to silence Our Lord. Freemasons have used it to silence the Church, and the Nazis used it to silence St. Maximilian and his like; however, where their are real men who stand up and oppose the lie, it is never completely successful, because such men are not silent and even when we can no longer hear their voices with our ears, their deaths are an even louder and more eloquent testimony. There is no one to be found in the world that does not search for happiness; indeed, in all of our actions happiness presents itself to us, in one form or another, as the end toward which we naturally tend. However, a happiness which is not built on the foundation of truth cannot endure, because everything else is a lie. The truth can be and is the only the unshakable foundation of happiness, for individuals and of all humanity. But happiness comes at a cost and sometimes men have to sacrifice their personal contentment and safety so that others might live and prosper. But for them, this is in itself an honor and a cause of true joy. Something to think about.